It was much more common in Maryland and the southern colonies. As the beliefs and customs of different European ethnic groups, as well as the American Indians, meshed, a distinctly American version of Halloween began to emerge. 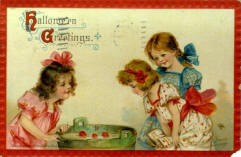 The first celebrations included "play parties," public events held to celebrate the harvest, where neighbors would share stories of the dead, tell each other's fortunes, dance, and sing. 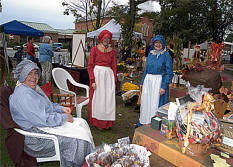 Colonial Halloween festivities also featured the telling of ghost stories and mischief-making of all kinds. By the middle of the nineteenth century, annual autumn festivities were common, but Halloween was not yet celebrated everywhere in the country. By the 1920s and 1930s, Halloween had become a secular, but community-centered holiday, with parades and town-wide parties as the featured entertainment. Despite the best efforts of many schools and communities, vandalism began to plague Halloween celebrations in many communities during this time. By the 1950s, town leaders had successfully limited vandalism and Halloween had evolved into a holiday directed mainly at the young. Due to the high numbers of young children during the fifties baby boom, parties moved from town civic centers into the classroom or home, where they could be more easily accommodated. 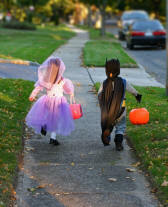 Between 1920 and 1950, the centuries-old practice of trick-or-treating was also revived. Trick-or-treating was a relatively inexpensive way for an entire community to share the Halloween celebration. In theory, families could also prevent tricks being played on them by providing the neighborhood children with small treats. A new American tradition was born, and it has continued to grow.